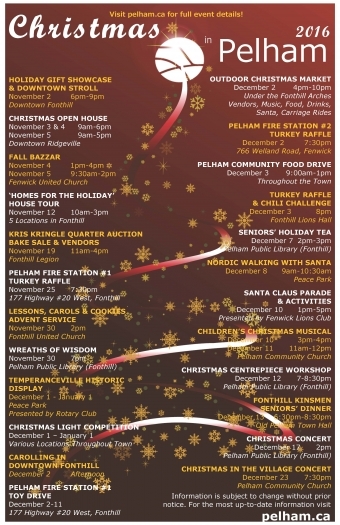 Christmas in Pelham has something for everyone during our community holiday celebrations. Residents, businesses and visitors are invited to participate in this year’s exciting Christmas in Pelham lineup of events. We have something for everyone during our community holiday celebrations. November 2 (6pm to 9pm): Holiday Gift Showcase and Downtown Stroll - Downtown Fonthill. November 3 & November 4 (9am to 6pm), November 5 (9am to 5pm): Christmas Open House - Shoppes of Ridgeville. November 4 (1pm to 4pm), November 5 (9:30am-2pm): Fall Bazzar - Fenwick United Church. November 12 (10am to 3pm): “Homes for the Holiday” House Tour - 5 locations in Fonthill. November 19 (11am to 4pm): Kris Kringle Quarter Auction Bake Sale & Vendors - Fonthill Legion. November 25 (7:30pm): Fonthill Volunteer Firefighters’ Association Turkey Raffle - Fire Station #1 (177 Highway #20 West, Fonthill). November 30 (2pm): Lessons, Carols & Cookies - Fonthill United Church. 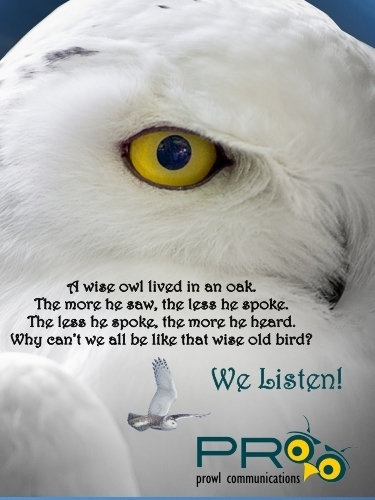 November 30 (7pm): Wreaths of Wisdom – Pelham Public Library (Fonthill), $20, please register. December 1 - January 1: Temperanceville Historic Display - Peace Park, Fonthill. Presented by Rotary Club. December 1 - January 1: Christmas Light Competition - Various locations throughout Town. December 2 (afternoon): Carolling in Downtown Fonthill. December 2 (4pm to 10pm): Outdoor Christmas Market - Downtown Fonthill Arches. Enjoy holiday vendors, music, food, drinks, Santa and carriage rides. December 2 - 11: Fonthill Volunteer Firefighters’ Association Toy Drive - Fire Station #1 (177 Highway #20 West, Fonthill). December 2 (7:30pm): Fenwick Volunteer Firefighters’ Association Turkey Raffle – Fire Station #2 (766 Welland Road, Fenwick). December 3 (9:00am to 1:00pm): Pelham Community Food Drive Benefitting Pelham Cares - Various locations throughout Town. 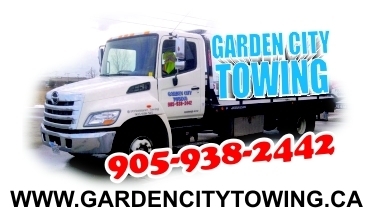 December 3 (8pm): Fonthill Lions Turkey Raffle & Chili Challenge - Fonthill Lions Hall. December 5 (6:30pm): Town of Pelham Christmas Card Contest Announcement - Town Hall (20 Pelham Town Square, Fonthill). December 7 (2pm to 3pm): Seniors’ Holiday Tea - Pelham Public Library (Fonthill). December 8 (9am to 10:30am): Nordic Walking with Santa Claus – Peace Park, Fonthill. December 10 (1pm to 5pm): Santa Claus Parade & Activities (we’re collecting letters for Santa) - Fenwick and Centennial Park. Presented by Fenwick Lions Club. December 10 (3pm to 4pm) and December 11 (11am to 12pm): Children’s Christmas Musical - Pelham Community Church. December 12 (7pm to 8:30pm): Christmas Centrepiece Workshop - Pelham Public Library (Fonthill), $26, please register. December 13 (6:30pm to 8:30pm): Fonthill Kinsmen Seniors' Dinner - Old Pelham Town Hall, 591 Canboro Road, Ridgeville. December 17 (2pm): Christmas Concert - Pelham Public Library (Fonthill). December 23 (7:30pm): Christmas in the Village Concert - Pelham Community Church. Tickets $17 in advance, $20 at door. 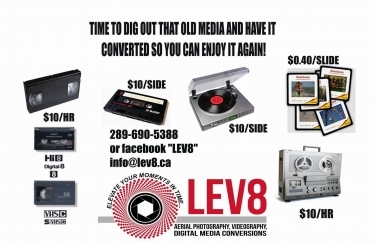 Be sure to look for our event posters, rack cards and advertisements around Town starting next week. Please note event information is subject to change without prior notice. 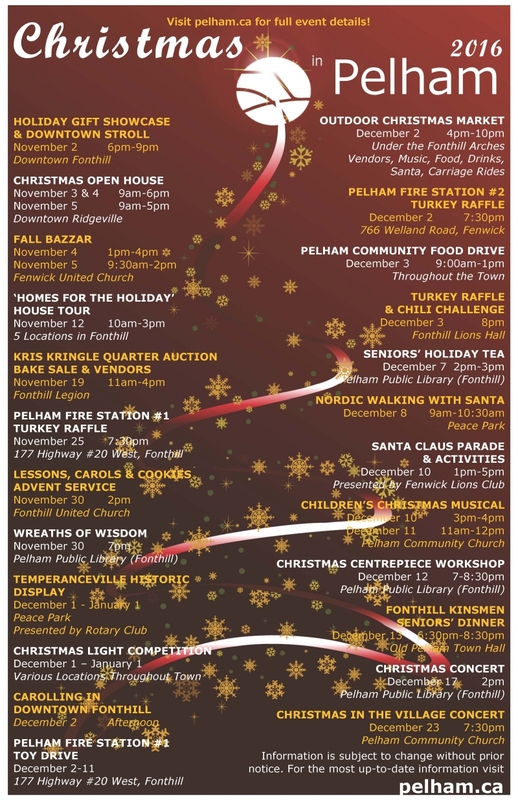 For complete and up-to-date event listing details, visit www.pelham.ca/christmas-in-pelham .